The EASIEST Thrift Shop Re-purpose EVER! A thrift shopping trip earlier this year netted this one Demco retro deco style metal bookend from the 1970's. This before pic was quite blurry in my dark laundry room. The color is beige. 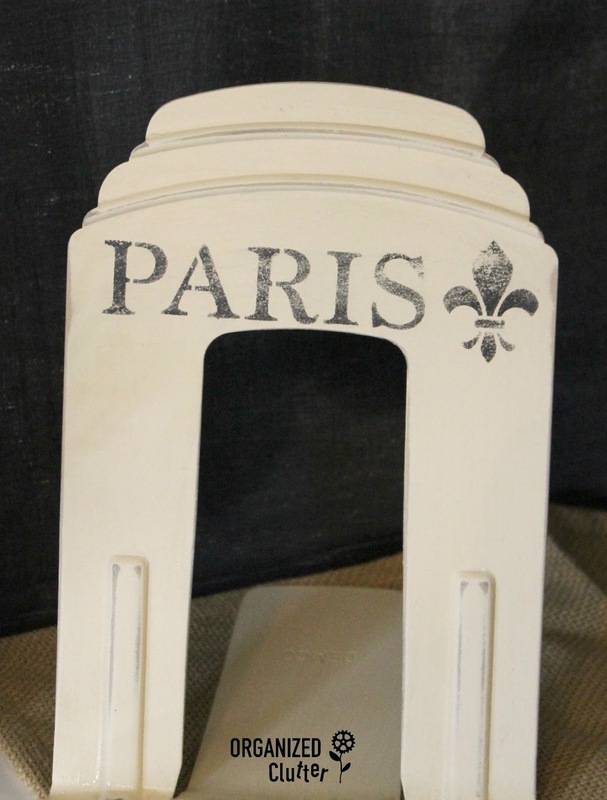 I had purchased my first can of Krylon Chalky Spray Paint in Colonial Ivory and this was a good opportunity to try it out. I loved the paint. I had enough left for another project or two. So I spray painted the book end with the creamy white. 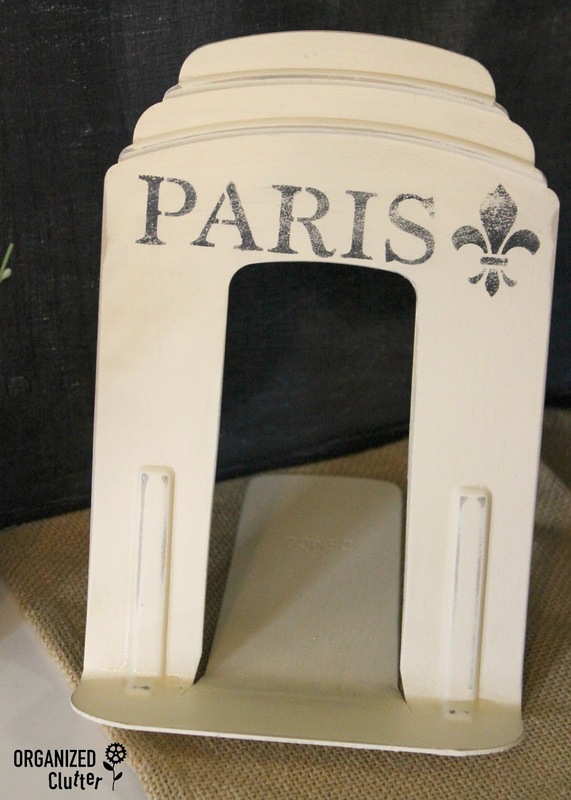 Then stenciled it with my Andy Skinner French Words stencil, using Paris and the Fleur d' lis. I used a 220 grit sandpaper and distressed the bookend and stencil very lightly. Then I brushed on some DecoArt Americana Creme Wax. Now that the painting and stenciling are done, it's time for the repurpose part. Bend the bookend so that the it becomes an ipad stand! My bookend re-purposed ipad stand! 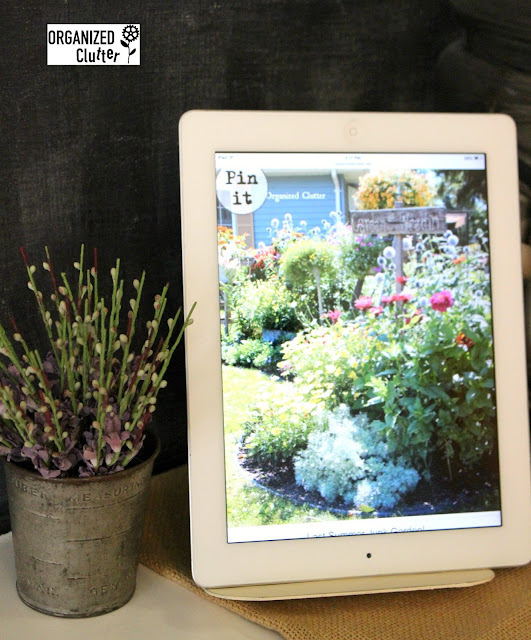 You can use your new re-purposed ipad stand in the kitchen for recipes or for looking at Organized Clutter's upcoming garden photos! I'm curious, where do you get most of your stencils? It seems like you must have a huge assortment? Easy peasy... and very clever too! I need one of those! boy, the paint is really expensive.. Brilliant! Such a simple idea, but so darn clever and creative. LOVE it! Now I'm going to be on the hunt for a bookend! Oh my goodness! 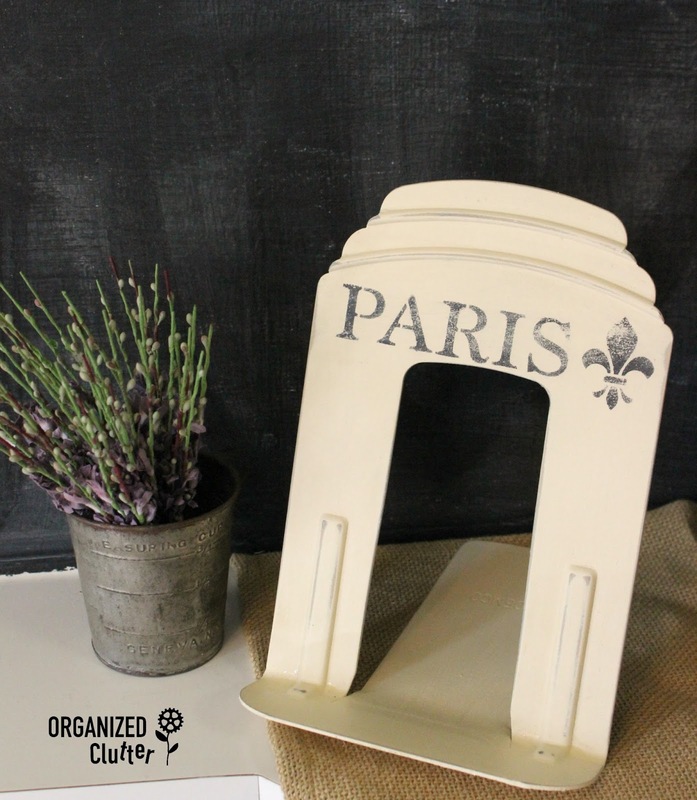 Great idea to bend the bookend! can't wait do try it!